We've just started our Geometry Unit. I heart geometry. It's one of those things that kids just get excited about. Shapes are everywhere! There are so many hands-on activities you can do with geometry. 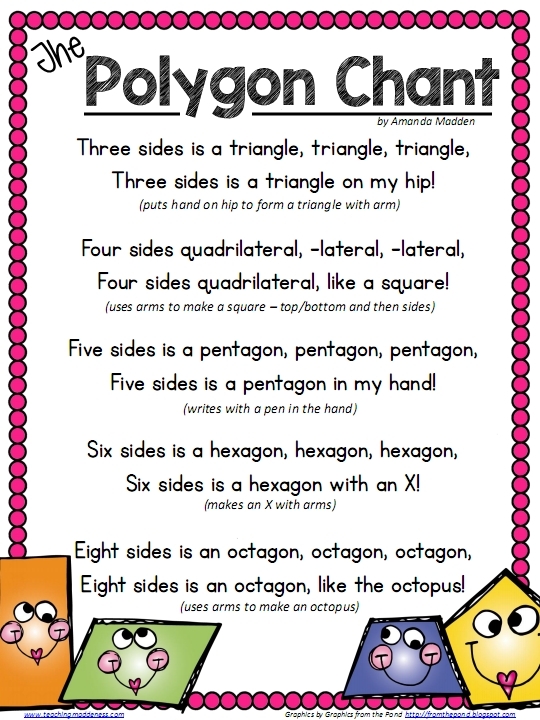 One of the first things we do is learn the names of common polygons. That can be trickier than it sounds - pentagons, hexagons, octagons....oh my! So, whenever my students need to learn something tricky, I try to come up with mnemonic devices for them. That's how this "Polygon Chant" was born. We talk about QUAD as meaning 4...my students know about twins, triplets, and someone usually knows quadruplets. I stress that there are 5 fingers on a hand and we hold a PEN with our hand....therefore remember that a pentagon has 5 sides. I tell students that HEXAGON has a letter in it that we don't see in a lot of words - X....siX also has this letter....therefore remember that a heXagon has siX sides! We talk about the prefix OCT as meaning 8. Where else have they seen this? Octopus which has 8 legs! Here's a little video of my students singing it on Day 1...they caught on pretty quickly! As I was preparing for my Geometry Unit, I realized that had NO geometry centers. Like none. Seriously. Out of all the center packs that I have in my classroom none of them included geometry centers. 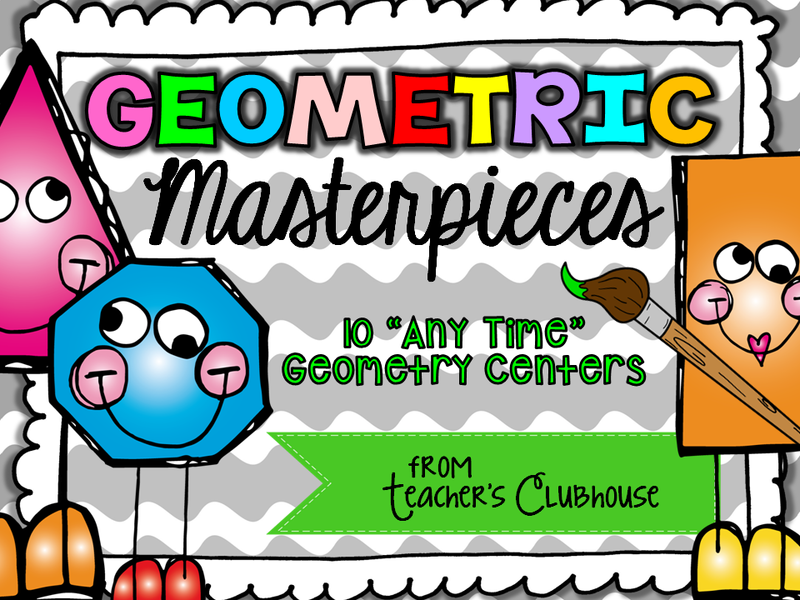 I am SO thankful I got the Geometric Masterpieces centers completed before starting this unit. My students are already eating them up! They love getting to use their "paintbrushes" (dry erase markers) to draw, divide, and shade shapes! 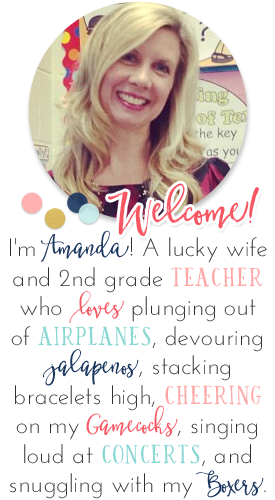 I follow you on tpt- Lisa from Third Grade Is Fun! I follow you on Instagram- Lisa from Third Grade Is Fun! And following on Instagram, too! I follow on TpT. These centers look awesome! I follow you on Instagram! Your product looks amazing! Thanks for the opportunity! The product looks fabulous! 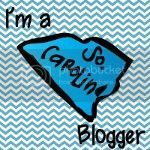 Follow on TPT! 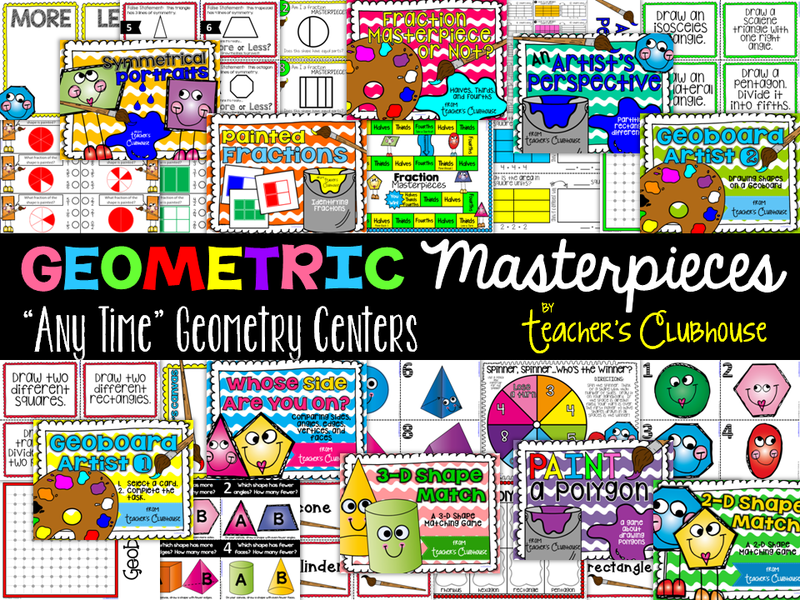 These centers look fabulous! I am following you on TpT.